We all needed a good chuckle in 2018, and these were the cartoon collections that made you laugh the hardest! As 2018 draws to a close, we share a list of our most popular cartoon collections from this past year. You got a laugh from golf, grownups, mammals and matrimony! 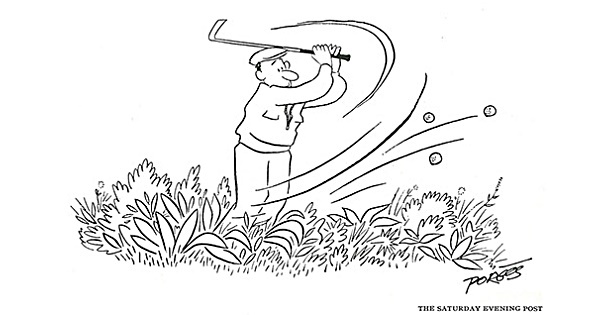 The game of golf has always been good for laugh! Have you ever tried to keep raccoons out of the trash? Or had to deal with squirrels demanding birdseed? Our cartoonists have these animals pegged! Those television ads can drive you up a wall, but we somehow managed to find the silly side of campaigning. We would never suggest our talented cartoonists spend a lot of time at bars, but they seem to overhear a lot of watering hole conversations. If life has taught us anything, it’s to expect the unexpected! 7. The Things Grown-ups Say! Marriage is a sacred institution that just might land you in an institution. Our cartoonists know what Art Linkletter knew years ago: out of the mouths of babes… comes trouble. They say good fences make good neighbors. These cartoons show that a good sense of humor helps, too!